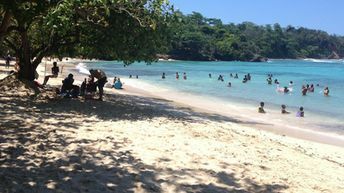 This beach ranks #2 of the "Best beaches in Port Antonio"
A short distance from the beach of Winnifred there are few hotels. However, in most cases it is better to stay in Port Antonio to visit the eastern beaches as day trip destinations. Fly to Montego Bay international airport (MBJ) or fly to Kingston airport (KIN). Next hire a taxi to the hidden pathway and walk a little through the forest. The best time for relaxing on Winnifred beach of Jamaica is a dry season, which lasts almost all year round - except for October.